Starvation Is Great. Pen, ink & gouache, 2018. 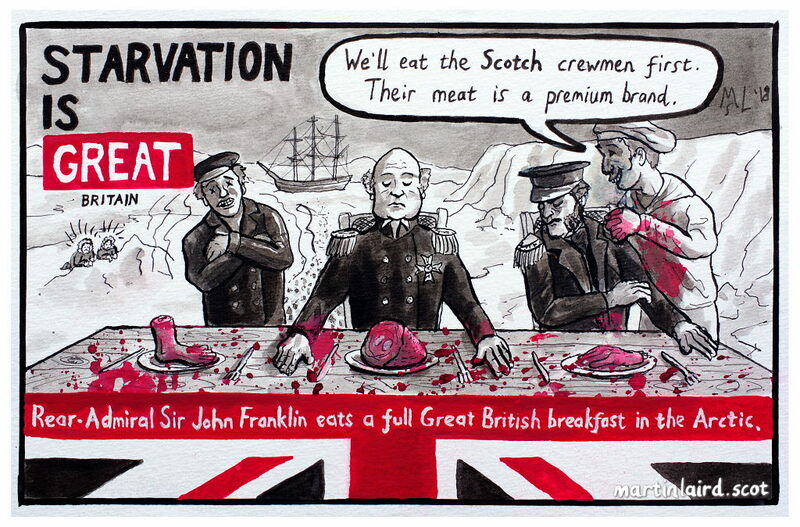 This cartoon was created for a forthcoming article by The Orkney News about John Rae; the Orcadian explorer who was ill-treated by the British establishment for truthfully reporting the gruesome fate of the Franklin expedition. Franklin was in search of a Northwest passage in Northern Canada, and he was credited with finding it despite dying in the attempt. A navigable passage was actually discovered by Rae. The Great Britain campaign is part of the ongoing One Nation project. The UK is regularly presented (by the Prime Minister and other establishment figures) as a single country, rather than a political union between several countries. In terms of trade this seems to be an attempt to homogenise the UK market in the face of the many challenges of Brexit. In the process the unique provenance and indicators of quality, such as Scotch Whisky or Orkney Cheese (terms protected by European law), will be lost. This is a serious threat to the food and drink producers of Scotland (and Wales), who are recognised worldwide for high quality and therefore command a premium price. Please see the #KeepScotlandTheBrand campaign for more information.